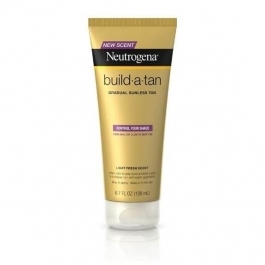 Build-a-Tan Gradual Sunless Lotion lets you control the shade by how often you apply it for a totally natural-looking tan. The moisturizing formula delivers just a hint of color with each application, allowing you to decide how deep and dark you want your sunless tan to be. Apply it more often for a deep, dark tan or less often for a healthy glow. Worried about messy streaks? Forget about it. This creamy lotion is clinically proven to provide natural-looking, even color that starts to develop in two to four hours. It's great for everyday use and dries in just five minutes.Get a sunless tan as individual as you are with color you can control. Blend evenly over freshly cleansed, exfoliated skin. Smooth on evenly, starting with your legs. Apply sparingly on your elbows, knees and ankles. Blend thoroughly. Wash your hands with soap and water immediately after use. Wait one hour before bathing or swimming. Color will start to develop in about two to four hours and will last several days. Reapply as needed to deepen or maintain color.